Please note: all of these photos were taken with my iphone while on vacation. 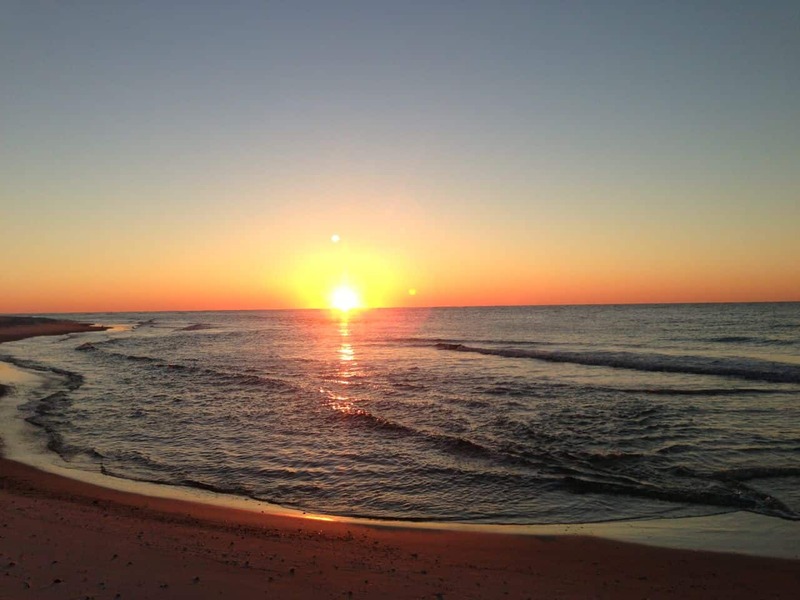 We recently went to the beach for a three day weekend and had a wonderful time. 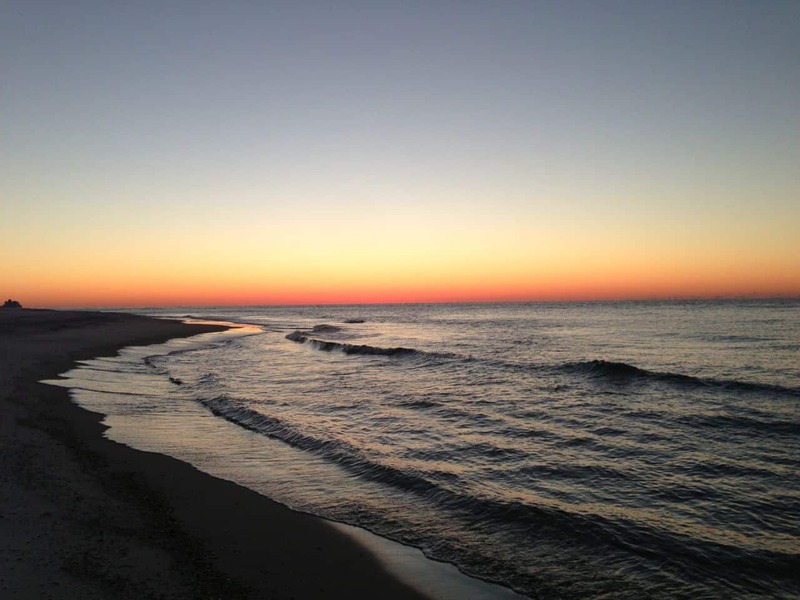 If you’re the type of person who enjoys clean, white beaches and serenity (rather than the party atmosphere), Alabama’s beaches are the place for you! The answer is ABSOLUTELY! Every chance I get. Cooking while on vacation, versus going out to eat, can save an obscene amount of money. Even if the four of us were to go through a fast food drive through nowadays it can easily top $20. For a fraction of that price I can feed us a much better meal. On this last vacation we did end up going out to eat three times, which was for supper each night. One of those times was worth it, and that was to Lambert’s in Foley, Alabama. The other two times – not so much. I really enjoyed getting up early, though, especially when I could go out on the balcony and watch the sunrise. 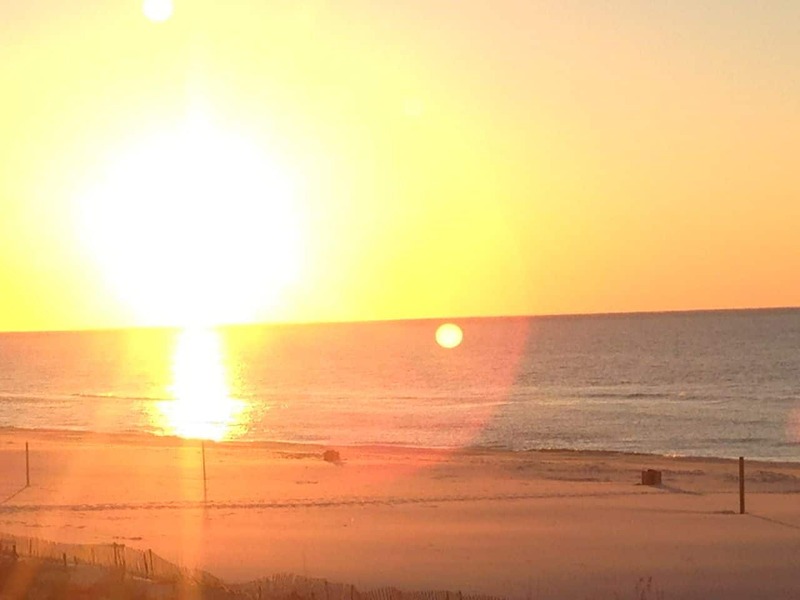 On our second day there, I was talking about how amazing the sun rising over the ocean was and told my family that I was going to watch it the next morning and if any of them wanted to watch it with me, I’d wake them up to see it and then they could go back to bed. I was pretty surprised but thrilled when all three of them immediately said they’d like to do that with me. I’ve got photos of that wonderful experience at the bottom of this post so be sure you check them out, and maybe start the tradition of catching the world’s best light show with your family a few times a year! Now how about making some burritos today and have an easy go of breakfast the rest of the week? 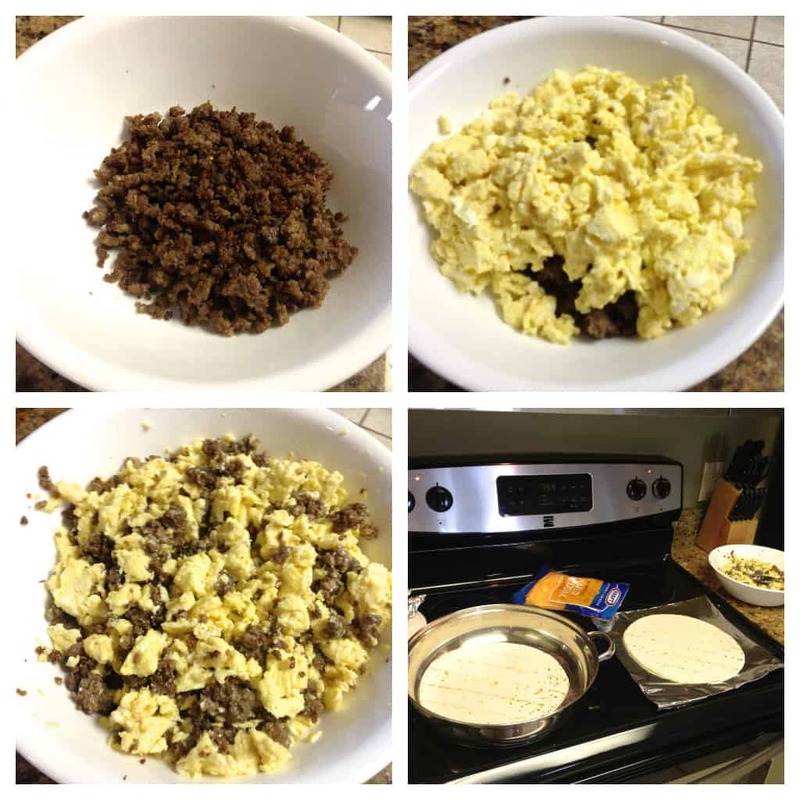 To start with, you’ll need: 10 – 12 large flour tortillas, 1 pound of breakfast sausage, a dozen eggs, and about a cup of cheese. IMPORTANT INGREDIENT NOTE: You can really customize these with whatever you like. Onions, bell peppers, chicken or ground beef instead of sausage, etc. I am just showing you the basic basic version, which is what I make for my family. We then customize our own as we reheat them. Brown your sausage in a large skiillet over medium high heat, breaking up with a spatula as you do so, until fully cooked and no longer pink in the center. Pour that into a bowl and set the bowl aside. Crack a dozen eggs into a bowl and beat them up really well. 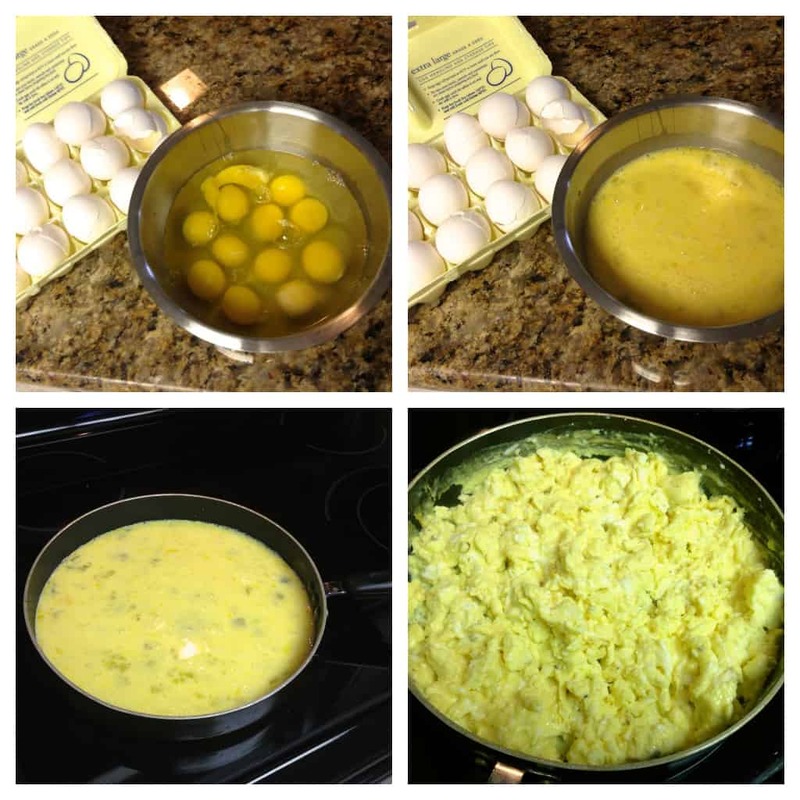 Pour into a large skillet over medium low heat and stir every so often until eggs are scrambled and no longer runny. Once eggs are done, pour on top of sausage in the bowl and stir to combine. Set up a work station with a large skillet to heat the tortillas in, space to fill them, cheese, and sausage and egg mixture. 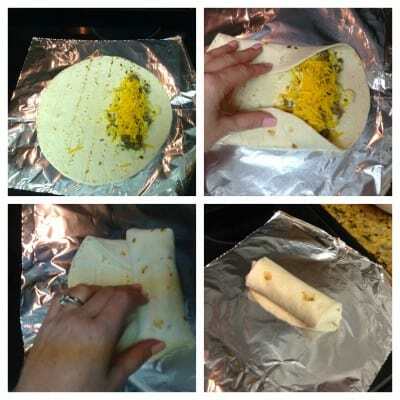 Now take a warm tortilla and lay it out on a work surface – I just used the piece of foil I planned on rolling it up in. Spoon a good bit of filling in a line down one side. By “good bit” I mean about 1/2 a cup. 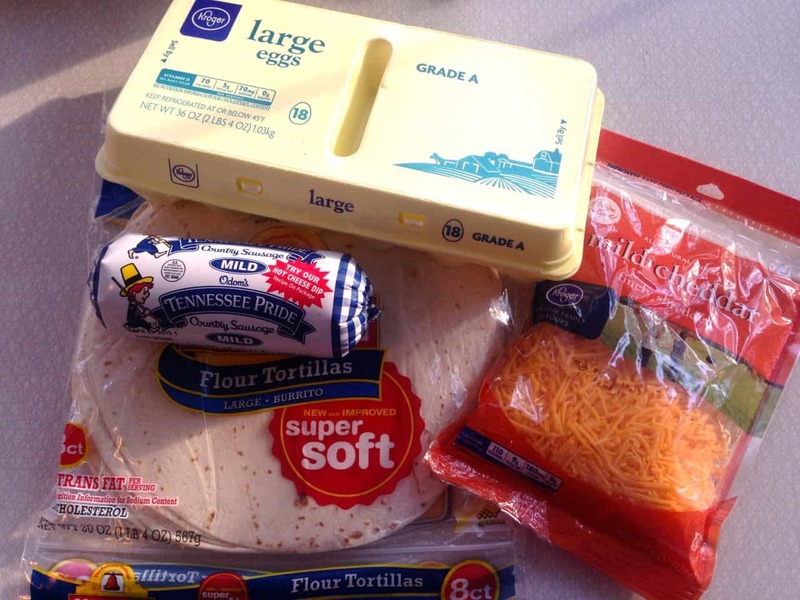 Fold up the top and bottom of the tortillas, this will keep your filling from falling out when you eat it, then roll your tortilla up tightly like I did in the photos above. After you finish making each tortilla, roll it up in foil and twist or fold the ends to seal, like this. Enjoy now and put the ones you don’t eat in the fridge to reheat and enjoy later! You can reheat these in the microwave or the oven. Instructions are included in the recipe at the bottom of this post. After mine is heated, I like to open it and add a few spoonfuls of chunky salsa, then wrap it up again and enjoy. If there is any filling leftover after I’ve used up all of my tortillas, I just pour a little cheese and salsa over it and eat it like a breakfast bowl! 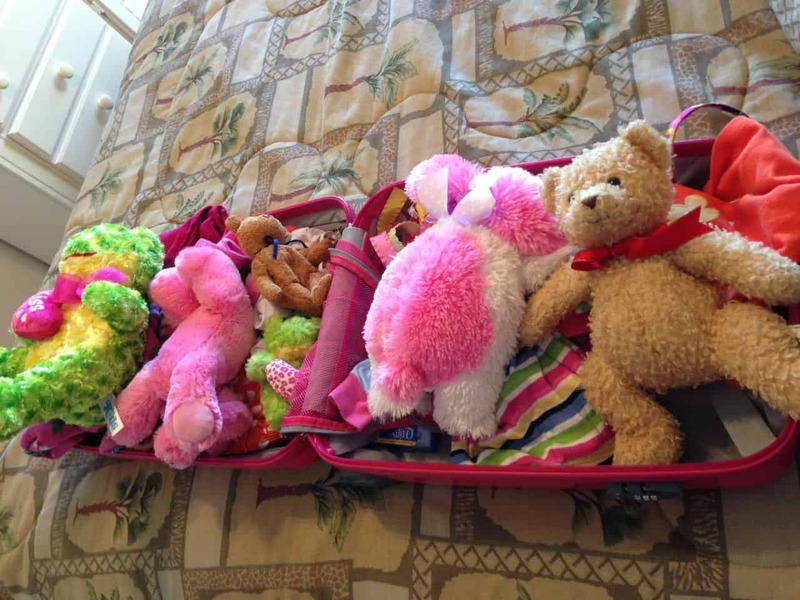 This is how an eight year old girl packs for the beach. And now for the sunrise! 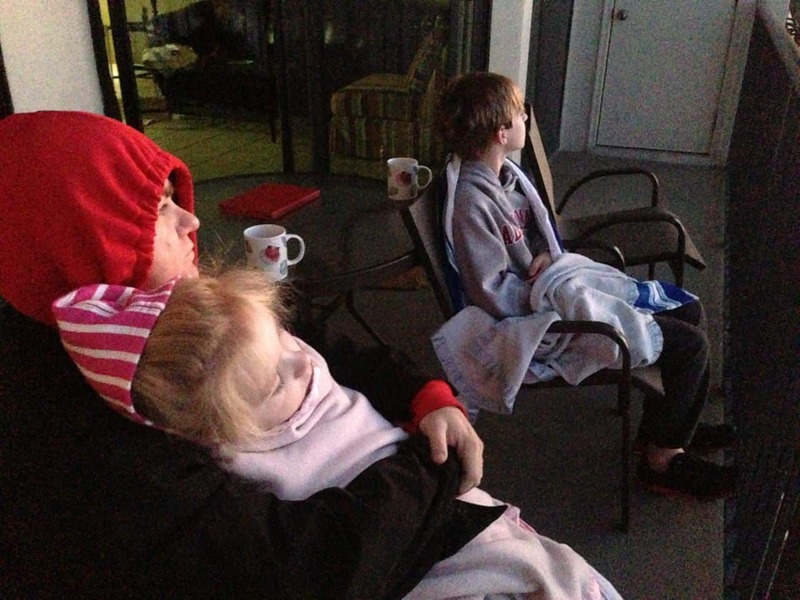 It was pretty cold when we got up so everyone is bundled. Here they are, waiting on the show to start. More photos from our weekend can be found on my Instagram by clicking here. If you follow me and your profile allows it, I always follow back because I wanna keep up with you, too! Crack the eggs into a large mixing bowl. Beat well with fork until well mixed. Can add a 1/4 - 1/2 a cup of milk or whipping cream if you like, for more creaminess. 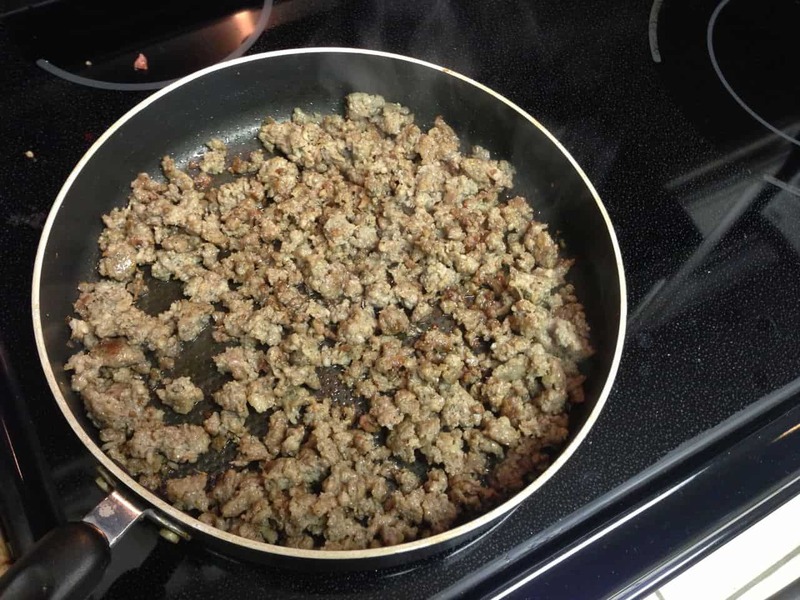 In large skillet, cook sausage over medium high heat while cutting with a spatula to break it into small pieces, until fully cooked and no longer pink in the center. Pour out into a large bowl and set aside. Reduce heat to medium low and pour beaten eggs into same skillet. Cook, stirring often, until eggs are scrambled and no longer runny. Pour on top of sausage in bowl and stir to combine. Heat tortillas, one at a time, in large skillet, about ten seconds on each side. Immediately fill with a line of egg/sausage mixture and sprinkle a little cheese over top. roll up tortillas (see photos in this post for how I roll mine) and wrap each one individually in foil, twisting or folding the ends to seal. Serve warm and refrigerate any leftovers. 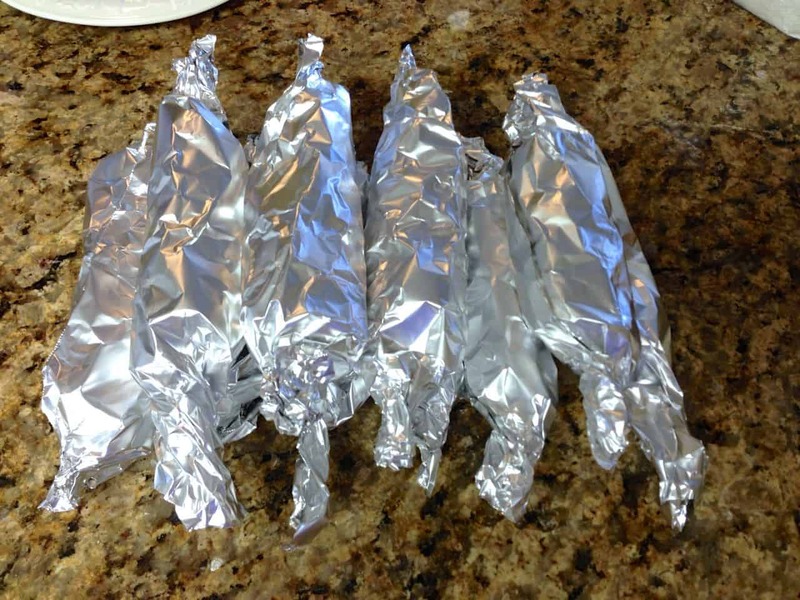 To reheat, remove burrito from foil and wrap in a paper towel. Microwave until heated through (about one minute in my microwave, but microwaves vary). To reheat in oven, preheat to 350 and place foil wrapped tortilla directly onto oven rack. Heat for 7-8 minutes, or until heated through. *IMPORTANT INGREDIENT NOTE: You can really customize these with whatever you like. Onions, bell peppers, chicken or ground beef instead of sausage, etc. I am just showing you the basic basic version, which is what I make for my family. We then customize our own as we reheat them. How well do you think they would freeze? I have made them and frozen them..they just don’t have a long “life” in the freezer! After a couple weeks, when only wrapped in the foil, mine got “dry”. They were, however, edible after cutting off the dried edges! Good luck! I will try these! And your pics are great. Makes me want to visit the beach today!! Fabulous for a husband that has work that *insists* he be there at the crack of dawn…. how inconsiderate, right? 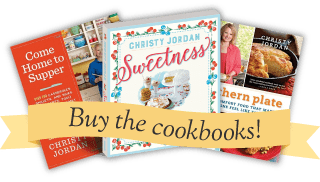 These sound easy, affordable and yummy – they hit all three of my buttons. Thanks for sharing! Mmmmmm. Making me hungry…and wanting to go to the beach! 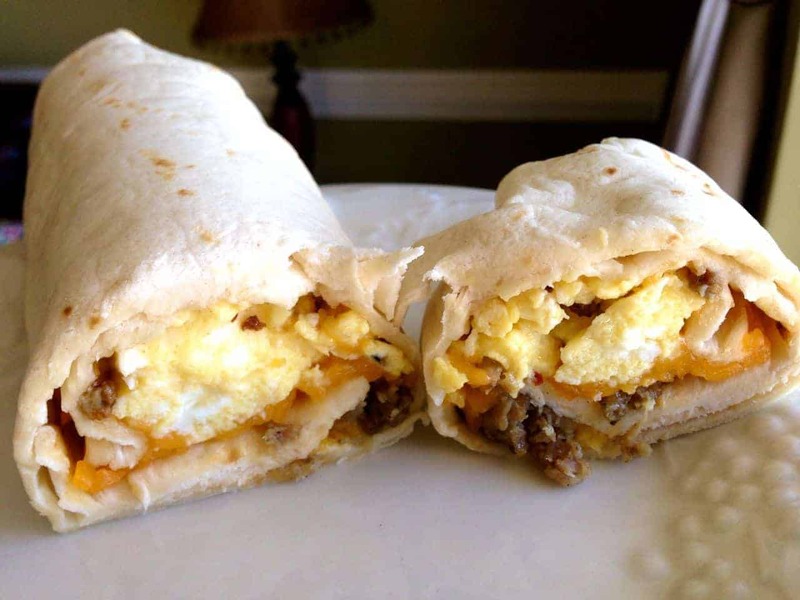 I have been making these breakfast burritos for several years and they are GREAT! One thing that speeds the assembly process for me is to heat the tortillas in the microwave (one at a time) for about 10 seconds each. They come out nice and soft and are easy to roll up. I make up a huge batch each time I do it, and they last in the freezer for several months, but ours rarely make it that long. Looks awesome. I also love the area and definitely love Lamberts….”Home of The Throwed Roll”. By the way, do you have a recipe that is like their macaroni and tomatoes? I made some freezer meals and took them on vacation this past summer. It worked so good. All I had to do was lay a meal in the frig.-that was frozen-and heat it up for supper. Homemade meal in a matter of minutes. Saved lots of money and was delish! E-mailed you at your yahoo address. Let me know if you do not get it and I will resend. I would also love your other “beach” recipes! We are planning a trip this summer and I would love to make these burritos and any other goodies you made! Thanks in advance! These are great to make and have ” on hand” for a quick breakfast!! Made them for a quick go-to-work breakfast during the week! I love this so much! Super easy and great for a vacation breakfast without feeling like I’mnot on vacation. I can add bacon instead of sausage for my bacon lovers! Also, your picturers are so beautiful. Made me excited about our family vacation coming up! How long do you think these will keep in the fridge once you make them? This would be great for my hypoglycemia. Thanks! Makes me really want to go on vacation, have never seen the ocean. Maybe someday. I have made these for years. We are big onion and bell pepper lovers so I cook them in with the sausage. Yummy with sausage, or bacon, or ham. You can really customize no end, sometimes I make them with spinach, tomatoes and white cheese. Love Gulf Shores and Lamberts!! These burritos sound wonderful, must try! These look delicious….and making them ahead is a great idea! I’m going to try it. Thanks for posting the vacation photos. It brought back some sweet memories. Our family found the Alabama Gulf Coast several years ago and it’s our favorite vacation spot for relaxing and just hanging out. I love the family atmosphere there. 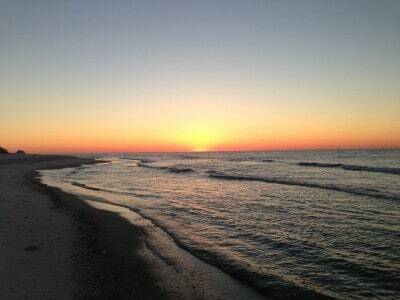 We usually rent a beach house in Gulf Shores and our two daughters and their kids all come. We travel all the way from Texas, but it’s worth it! For some reason, I cannot access the recipe itself to print it. Suggestions? We make these just about every week…but b/c they get eaten so quckly we just wrap them in plastic wrap and microwave for about 45-50 secs. and these suckers are gone pretty fast but I guess they would be with 6 people eating them… we also take the filling and make toast sandwiches for those with braces… and hubby sometimes would just rather the filling be on biscuits instead. Hubbys…. you gotta love them… he just wants something fast that he can throw in the micro wave while he is filling up his soda cup grab it and walk out the door… he is literally a 15-20 minute dresser for work. lol Thank you for the pictures and all the recipes…Christy you’re a wonderful encourager! Oh my goodness, thank you so much Sheri!! I am so glad that these are a hit at your house, love all the variations that you have some up with!! When I make these, I add a package of hash browns and more eggs. It stretches it a lot further for a few dollars more (much needed when you have 10 and 15 year old boys). I usually will get 3-4 days of breakfast for 6 out of this. They did throw rolls Robin!! Thank you so much Meridith!! I add chopped canned chilies to mine. Love Katie’s packing. 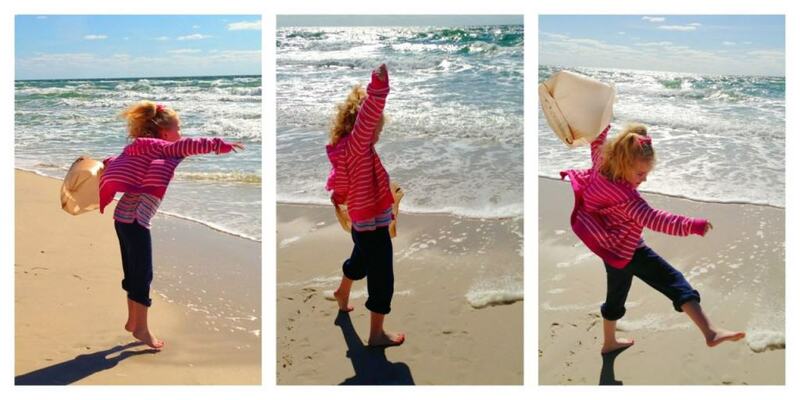 Last trip to the beach, my granddaughter “packed” grocery bags so she would be sure to have enough to collect shells. Kids sure have a different way of thinking about things don’t they? I love Katy’s love of life and her unusual view on it. I should try these. YUM! 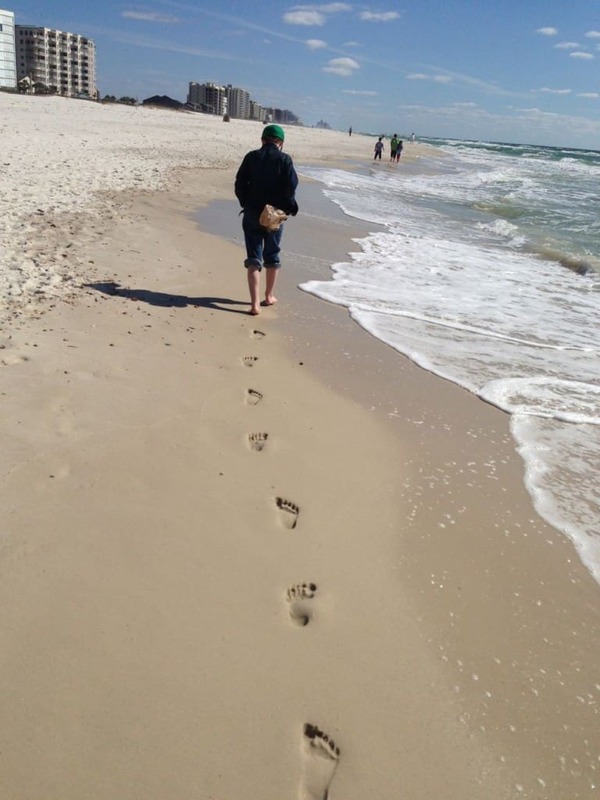 Orange Beach is a nice place to go and we like to hit up Lambert’s too! They do great frozen. I wrapped mine in plastic wrap and put them in freezer bags. They lasted for months. Plus you can leave them in the plastic wrap and microwave in a couple of minutes straight out of the freezer. This is a great recipe. My granddaughters love them! Looks yummy! I grew up in Mobile so am quite familiar with Orange Beach, Foley, etc. Have lived in Panama City for last 25 years but guess where we vacation? Foley area, of course! We camp at Lake Osprey RV Resort and ALWAYS eat at Lamberts! And of course always have to spend at least one day at the Outlets while there. Like you, I don’t want to eat out the entire time so I cook ahead of time and take meals with us but also plan on cooking at least one big meal while there. Great recipe. Thanks for sharing. Requested to follow you on Instagram. I’m WAGNERJB. Burritos without chili (red or green)? That is a sin here in New Mexico! We say a day without chili is like a day without sunshine! Thank God we have an abundance of both here!! Yum! We do these for breakfast on the weekends, but I never thought to make extra! Also, thanks for the oven heating instructions – we got rid of our microwave a few years ago and heat everything in the oven now. Love it.